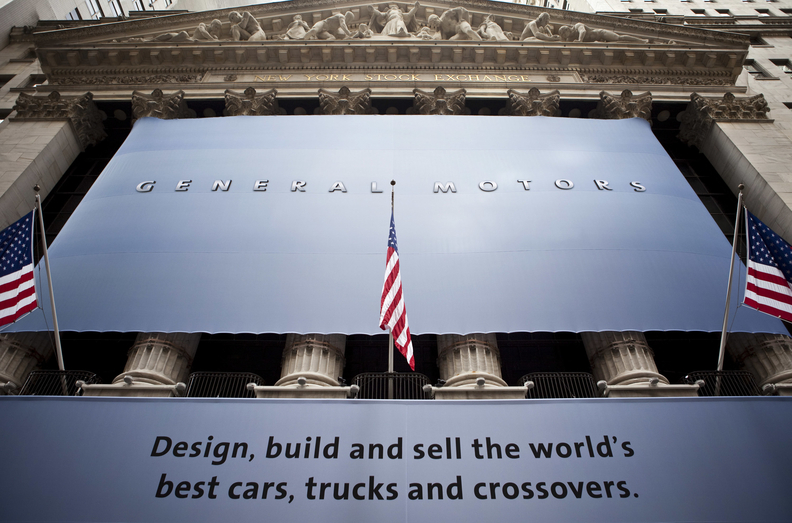 A GM banner hangs outside of the New York Stock Exchange in New York on Nov. 18, when the automaker shares began trading. The U.S. Treasury received $11.7 billion in proceeds today from GM's initial stock offering. WASHINGTON (Bloomberg) -- U.S. assistance to General Motors Co. and other automakers is on track to cost “far less than anyone had first anticipated” as the Treasury Department recoups the funds it used to stabilize the industry, the acting head of the Troubled Asset Relief Program said Tuesday. “General Motors' successful initial public offering is another important milestone in our efforts to recover TARP funds on behalf of the American taxpayer,” Tim Massad, the Treasury's acting assistant secretary for financial stability, said in a statement. The Treasury received $11.7 billion in proceeds Tuesday from GM's Nov. 17 stock offering. If GM's underwriters decide to exercise their option to buy additional shares, the Treasury would receive further proceeds of $1.8 billion, the department said. The $700 billion TARP was used to rescue a broad swath of the U.S. financial industry during the 2008 and 2009 financial crisis. Of the $388 billion spent under the program, $252 billion has now been repaid, the Treasury said today.